We wish you all a Happy Thanksgiving. We are very thankful for each and every one of our clients that have trusted us with their website designs, internet marketing, logo design and more. We are also extremely grateful for the team here at Lineberry Marketing working hard every day to help our clients succeed online. 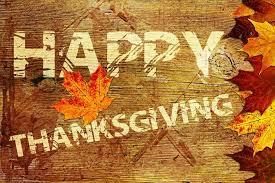 We hope you all have a safe and restful Thanksgiving and take time to enjoy it with family and friends. We will be closed on Thursday, November 23rd and Friday, November 24th. Lineberry Marketing is proud to announce that Jeff, Lizzy and Rebekah each achieved their Google Analytics Certification last week. This certification demonstrates a thorough understanding of how to collect data about your users’ experience on your site, configure and process that data, and create meaningful reports using that data. These reports provide insight as to how we can improve users website experience, increase traffic and generate more leads. Lineberry Marketing is excited to announce the addition of Raleigh native, Rebekah Werner to the team. Certified in Google Adwords, Rebekah assists clients in gaining more exposure and leads online through the Google Adwords Advertising Program and also assists with Search Engine Optimization and other Digital Marketing campaigns. Rebekah is a graduate of the School of Journalism and Mass Communication at UNC-Chapel Hill and is married with three children. Lineberry Marketing wishes all our clients a Happy 4th of July! With summer in full swing, we are busier than ever; in June we launched a record number of new websites, we took on several new and exciting marketing clients and are expanding the number of Raleigh web hosting clients we are serving. The first half of the year could not have gone better and we are very thankful to everyone involved in our success. Recently I received an email from a client’s private email account with what appeared to be a Dropbox invite to view a PDF. Since I wasn’t expecting this email or file from our client my suspicions were raised. After emailing the client and asking if they had sent the email, which they hadn’t, I hovered my mouse over the button in the email that says, “Download PDF Here”. The link preview showed it went to a site other than Dropbox which clued me in further that this wasn’t a request from my client but indeed someone trying to gain account access information. This is what is often referred to as “phishing”. In the spirit of giving thanks, we would like to extend a warm thank you to all of our clients. This is a special time of year, as we are spending time with family and friends, enjoying delicious food and expressing gratitude for all the success the year has brought for us and for our clients. Lineberry Marketing is so grateful to be your choice for innovative design and marketing solutions. This season, we can’t help but reflect on the many websites launched, logos designed, successful marketing campaigns run, new business relationships formed and deepening relationships with current clients. It has been an incredible year and we look forward to finishing the year strong and seeing what 2015 has to bring.